The Museum of Tolerance in partnership with the Go For Broke Educational Foundation presents oral histories from members of the Japanese American 522nd Field Artillery Battalion in the United States Army. A selection of video interviews with veterans of the 522nd provide personal accounts of the liberation of the sub-camps of the Dachau concentration camp complex in Germany. The Japanese American 522nd Field Artillery Battalion was one of the driving forces that helped to liberate Jewish survivors of the Landsberg-Kaufering Dachau Death March and Dachau sub-camps. It was also one of the first allied troops to help liberate the Dachau sub-camps and the only Japanese American combat unit to fight on German soil. 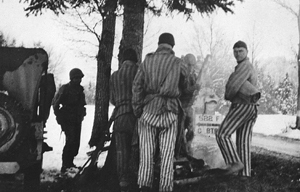 The irony of the 522nd's encounter with the Dachau inmates was that many 522nd soldiers and/or their family members were also incarcerated in segregated camps in their home country during the war. The 522nd was activated on February 1, 1943 in Camp Shelby, Mississippi. The 522nd earned the reputation as one of the fastest, most efficient artillery units in the European Theater operations in World War II. The artillery provided valuable support fire for the Japanese American 100th Infantry Battalion and 442nd Regimental Combat Team. Joseph Ichiuji, a 522nd veteran, said, "Whereas the American camps were for the duration of the war, the German camps were for the extermination of the Jewish race. Yet, the reasons behind these acts are the same and that is the singling out a race through acts of racial prejudice."